KHHI's absolute exclusivity; it is the most special and expensive presentation of ours as yet.. 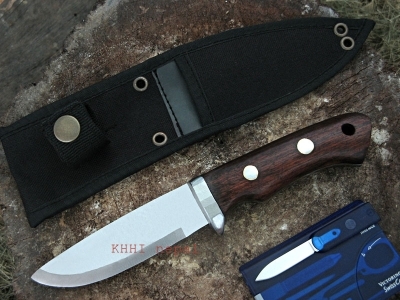 This Kothimora kukri is KHHI's absolute exclusivity; it is the most special and expensive presentation of KH as yet. With accordance to its grand name the khukuri carries all it takes to be an aristocrat because of its marvelous craftsmanship, stunning adornment and costly materials used. Royal Kothimora is exclusively created as a special endowment on special occasions, a remarkable gift for extra ordinary people, for ceremonial events and even for grand collection at one’s cache. 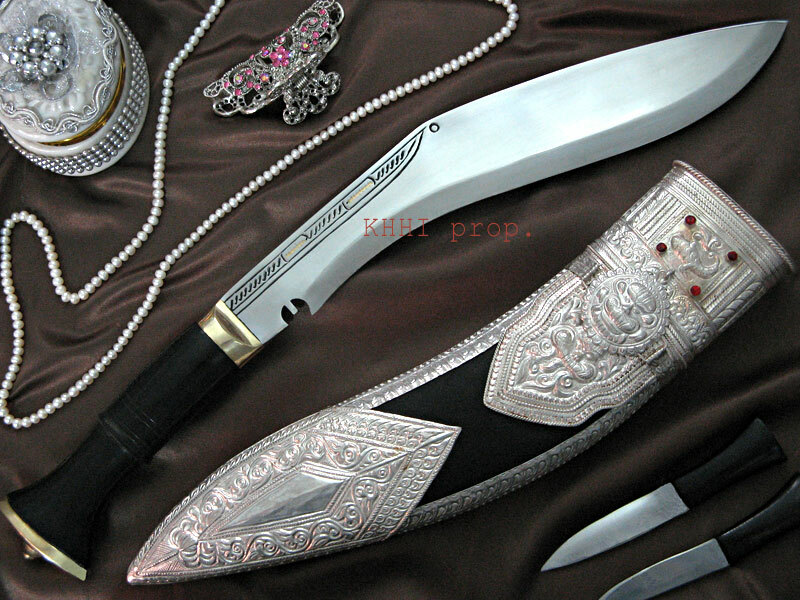 The classic 'Kothimorial' look with complete hand done artistic traditional patterns along with the amount of silver used (massive 200 grams) makes this knife so unique, majestic, grand and out of ordinary. The Royal Kothimora’s silver scabbard differentiates it from the rest. This is where all the hard work, skill, time and material are put. The silver case is given a very classic and authentic look like that of the antique Kothimoras. Unlike the contemporary ones, velvet fabric is completely discarded and buffalo hide is used as background on top of which silver is laid artistically. The silver work is done (assembled) one by one serially by bare hand starting from the throat to the tip until all details and patterns are executed professionally to their respective positions. The volume of silver that is used in making the knife also significantly contributes to its high price. Almost about 200 grams of pure silver is mixed with tiny portion of white metal (in order to harden the silver for rigid contours) and crafted into a work of art that what we at KHHI call as the 'Royal Kothimora (Majestic)'. This Kothimora khukuri is the most precious of all khukuris hence titled as Majestic as its the most vauleable silver kukri at Khukuri House. The khukuri blade is designed plain, simple and typical yet with the ability of taking upon any opponent or obstruction. The blade is a regular Kothimora but special attention and time is put to make the knife special and strong. The 11 inch long blade is highly polished to furnish a perfect match to the scabbard. A typical set of Kothimora Karda Chakmak (two small knives at the back) are included to give an overall look of an ancient Kothimora kukri.